Full disclosure: I love Amy Hill Hearth. Over the years, Amy has become a very good friend. And I am all kinds of excited for the world to read her fiction debut, Miss Dreamsville and the Collier County Women’s Literary Society. Be sure to check the end of this post for your chance to win a signed copy. I love when authors switch genres successfully. What made you decide to try your hand at fiction? I never thought I’d write fiction. I was taking a breather from the publishing business, that’s all. I started what I thought might be a short story, but then something strange happened – I fell in love with my characters. I kept writing and writing, and I began to wonder, Could this be a novel? The title character was inspired by my late mother-in-law, a Boston beauty who was a very intelligent woman but also restless, flirty, and a bit vain. As a middle-aged wife and mother, circa 1962, she moved with her family to a sleepy town in Collier County, Florida. She managed to ruffle the feathers of the town fathers almost immediately. That was the springboard for the novel. It must have been a story I really wanted to tell, because it just poured out of me. How many towns/cities can count you as their hometown girl? Please explain. My dad is a retired executive at General Electric, which meant we moved every five or so years when I was growing up. What this means is that I have a bunch of places I call home and where I have maintained friendships for decades. In terms of the place that had the greatest impact on my life, I would say that was Columbia, South Carolina. I was six years old when we moved there from Schenectady, N.Y. in 1965. Oh, how I loved South Carolina. I thought I was Huckleberry Finn. I even tried to build a raft. On my first day of school, I came home and announced that I couldn’t understand my teacher, but within a week, because I was so young, I had acquired my teacher’s Southern accent. We lived in South Carolina for six years. To this day, I love the South, I love the North, and frankly I could live happily anywhere in the East, from Maine to Florida. Were you a childhood reader? What books and characters did you love? Let me tell you a story. (This is a Southern way of answering your question.) A few years ago my parents “downsized” and moved to an apartment. This was great for them but a crisis for me. My three older siblings had long since taken most of their stuff but somehow I had missed the memo. At the age of 47, I was summoned home one last time to clean my room (my mother actually used those words). I had to sort through all of my treasures. My dad started bringing down box after box from the attic with my name carefully written on the side in his handwriting. I would say 90 percent of those boxes contained books. And so I was reunited with books I hadn’t seen in years. I think my favorite picture book was The Story About Ping, the little duck who lives on a boat on the Yangtze River in China. Another favorite was Blueberries for Sal, about a girl who goes berry picking, drifts away from her mother, and encounters a bear. My Dad read aloud to my sister and me every night before bedtime, and there were several books, like Ping and Blueberries, that we would beg him to read over and over again. Most of my books were hand-me downs: Dad’s copy of Treasure Island and Mom’s Nancy Drew mysteries; my cousin’s copy of Cheaper by the Dozen; my grandmother’s copy of Gone with the Wind, which I read the summer I was 13; an ancient copy of Little Women (I was named after the character, Amy) and much, much more. I was frantic, however, when I couldn’t find the old set of Little House books until I remembered that, some years earlier, they’d been passed along to my nieces. I know you have a major publicity schedule for this book. Have you started yet to think about what’s next? Like Dora, I think it’s wise sometimes NOT to make future plans. Other than traveling to promote Miss Dreamsville and meet my readers, I will wait and see where the road takes me. Thank you so much, Amy, for taking the time to visit here. This entry was posted in Uncategorized and tagged Amy Hill Hearth, Authors Guild, Collier County, Dora, Florida, Having Our Say, Miss Dreamsville, New Jersey writers, novel, The Delany Sisters. Bookmark the permalink. Amy, I read about your book a few weeks ago and was so interested and intrigued! I love your story of being summoned home to “clean your room.” I have had that same exact experience, down to the labeled boxes that my father made. My “junk” was all things with words too: books and books, journals and letters…being reunited with books is such a unique experience, I think, because it not only beings you back to a time and place but it becomes a fresh new relationship at the same time. A good story is a good story and makes an impact no matter what the age of the reader. Terrific interview! As a father, I hope I can show the same kind of diligence and care in preserving my own children’s books. And I’m very struck by the concept of allowing the future to evolve instead of trying to line it up like a row of dominoes – food for thought, especially at this time in my life. Thanks to both of you! What a great interview, and so inspiring to read about such a successful genre-jump. The book sounds wonderful–I look forward to seeing it! Great questions about what sounds like a great book. Thanks for sharing everything, Amy and Audrey. My mother is always bugging me to come back home and clean out my room. I keep putting her off, but I’m afraid that eventually she will give away my Berenstain Bears books! Amy, the new book sounds fabulous, and I love the title and the cover. It’s definitely going on my to-read list! I know Amy from Facebook! I’m delighted to learn more about you in this wonderful interview and I see great things for you and your new book! What a charming interview. I imagined hearing it spoken in a soft southern drawl, all cozy and inviting. Your book sounds great and I look forward to reading it. Oh Amy – your book collection sounds absolutely like mine. What fun it must have been going through those boxes. Audrey and Amy – you’re lucky, lucky ladies to have found each other. Amy, what lovely advice to end with (and a beautiful blog title) – to see where the road of life takes you. This sounds like a perfect choice that I will have to tell my book club about, and I have no doubt it will take you to great success. Good luck, and congratulations! Your title character seized my interest right away! Definitely adding this to my TBR pile. My mother, unbeknownst to me, saved all of my favorite books from childhood and gave them to me after my own children were born. What a surprise and treasure. I think she thought I’d give them to my kids, but NO WAY. I’m keeping them for me. 🙂 I am stashing away all my own children’s favorites for when they have children of their own, though. What a wonderful tradition she started. Thanks for the wonderful interview! I’m really looking forward to reading this book. I love the advice about letting things unfold as well and not over-planning. It feels so shiftless and disorienting to not have a plan for everything, but, sometimes, it’s just what we need. Lovely. I’d recognize that second grader in the grown up photo- maybe the secret to keeping that kid-lit writerly spirit. Thank you both for a thoughtful interview. What a lovely interview! And to think that she was reunited with her childhood books — wonderful! Thanks for sharing this gem of an interview. I can’t wait to read her book! This interview is so Amy and so Audrey. Of course, I say that as a member of their writing group. I highly recommend the book. Amy, I loved the Delaney sisters’ book–and I look forward to reading your new work! What a sweet interview. I love how you two met, and I love that Amy’s parents preserved her books in hand-labelled boxes and summoned her home to “clean up her room” and take the boxes with her. One of our kids’ favorite books, Never Tease a Weasel, didn’t last beyond four kids — too many readings eventually wrecked the binding. But after diligent hunting I found a replacement at a used books store, and gave it to our daughter to read to her son. I hope he loves that book as much as she did. Best wishes, Amy! I’ve let most of my old books go, and now I’m regretting it more than ever! Lovely interview, ladies! Amy, my mom also saved my favorite childhood books, and they sit on my kids’ bookshelves today. We also moved around a lot when I was a kid, and books were the one constant I had from place to place. Looking forward to reading your book! Amy, I’m in awe of both THE DELANEY SISTERS and of your ability to navigate genres and audiences. Reading your post gives me pangs for the children’s books that I gave away when our family moved from New Jersey to Texas almost 33 years ago. I still miss some of the very ones you mentioned because, although I can re-purchase them, I can’t give the very copies my daughters read to their daughters. I wish you the best with MISS DREAMSVILLE. She’s sure to be a winner. Thanks for giving me the perfect nugget to chew on this week! My childhood books also influenced my choice of profession as a children’s librarian. Seeing the covers of your old favorites brought back warm memories but also regrets that children of today overlook such classics because of their older appearance…I am seriously considering a classic storyhour where the children just listen with their eyes closed and really experience the story! I loved your story of the Delaney Sisters and am looking forward to your fiction debut! Good luck! Audrey, I am also looking forward to meeting you at the NJASL conference! Loved this interview! And, Audrey, I love how you were embraced into the writing community. When I moved to FL nearly 16 years ago, the same thing happened. Now, my writing peeps are the closest thing to family I could hope for. Thanks for sharing this! Wonderful interview. Looking forward to reading Miss Dreamsville. I loved your set of Little House books. I still remember borrowing them one by one and reading them. Columbia was a very charmed place and a very charmed time in our lives. I’m a librarian, and read the book the second it came in the other day, on Audrey’s recommendation, before anyone else could get their hands on it. You see, I spent three years as a reference librarian for the Collier County Public Library system. I loved the book and was fascinated by how much had possibly changed down there…or not changed. I am happily back up north now. But, thank you for the vicarious trip back to Naples, and back in time! A lovely interview. Thanks for introducing me to Amy and her book! What a lovely interview! I still have two books that I somehow managed to keep from my childhood. Jim the Cat and Horton Hatches an Egg! I wish I had more of them! I don’t know what happened to all the rest, but I know I’ve kept boxes full of the favorites from my own two kids. I hope one day they appreciate them like we do! Amy, Ping is on our shelf of passed down books too. My granddaughter, aged 4, loves it. We read it maybe once a week. 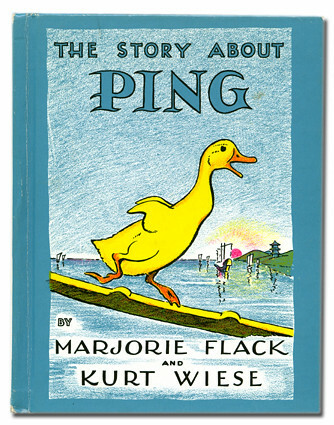 But MY first view of Ping, about 56 years ago, was digital–no, not digital, had to be analog–on Captain Kangaroo. It may have been in black and white even, the images in my memory of childhood television in southeast Arkansas blur between the black and white set and the color console we eventually got. But I loved it then, love it now. Thanks for sharing. Thanks also Audrey for sharing Amy with us.